The Knowledge Sharing Center – Preparing Historically Black Colleges and Universities for participating in Federal Government contract opportunities. This site is funded, in part, by a grant from NASA allowing free access to faculty, staff, and students of Minority Serving Institutions. The Knowledge Sharing Center (KSC) is here to prepare Historically Black Colleges and Universities, as well as other Minority Serving Institutions for participating in Federal Government contract opportunities. A Resource for Universities, Agencies, and Companies! HBCUs can generate revenue — and propel their scientists and students to the top of the competition — by developing their contract-based research and development capabilities. Here in the Knowledge Sharing Center, universities and companies that have established past performance through contracts and subcontracts with government agencies are exchanging information and resources in an effort to increase mutually beneficial teaming opportunities. 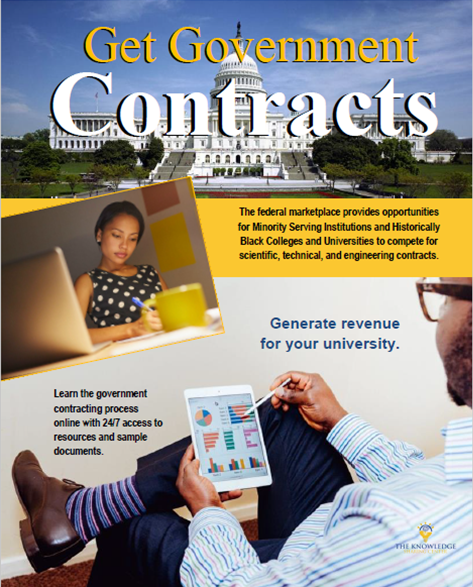 Courses are designed to help HBCUs and MSIs understand government contracting programs. Our mission is to prepare HBCUs and MSIs for participating in Federal Contract opportunities. Training Modules will teach you everything you need to know, from understanding the FAR System to best practices. The course material includes Workbooks for each module featuring tasks to complete, enhancing your learning experience, along with links to online resources. Many federal agencies are dedicated to expanding the diversity of their contracting relationships. Universities are known for innovation. Within the walls of these institutions, researchers are advancing space technology, cyberspace security, emerging biotechnologies and sustainable energy sources. The Knowledge Sharing Center is a place where agency program managers can connect with HBCUs and MSIs interested in contracting to transform ideas into products, processes and services that the government needs. Within this site agency representatives can participate in webinars, contribute content to help prepare potential partners, find subject matter experts and collaborate with companies who also are interested in entering into partnerships with Historically Black Colleges and Universities. Become a Knowledge Sharing Center member today and benefit from the experience of government contracting experts. 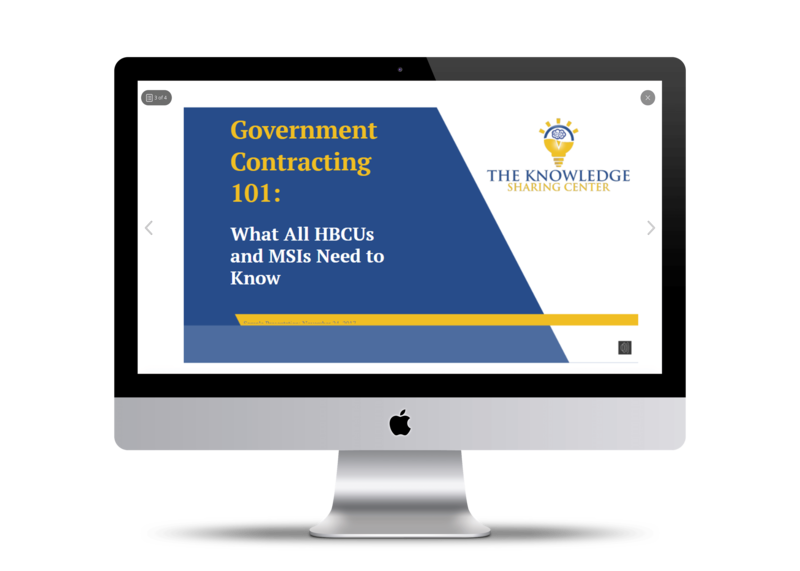 This course is designed to help HBCUs and MSIs understand government contracting programs. It is about helping HBCUs and MSIs obtain and maintain Federal Contracts. Requirements: Subscription to KSC. The annual membership subscription for academic institutions is $99. Become a member now. This module provides links to useful websites to help your institution begin the process of becoming a government contractor, as well as understand key terminology, regulations and requirements. Ready to find out more about The Knowledge Sharing Center? Drop us a line today and we will answer any questions you may have.